Ever since the definition of the Neolithic Revolution by Vere Gordon Childe, archaeologists have been aware of the crucial importance of food for the understanding of prehistoric developments. Numerous studies have classified and described cooking ware, hearths and ovens, have studied food residues and more recently also stable isotopes in skeletal material. However, we have not yet succeeded in integrating traditional, functional perspectives on nutrition and semiotic approaches (e.g. dietary practices as an identity marker) with current research in the fields of Food Studies and Material Culture Studies. 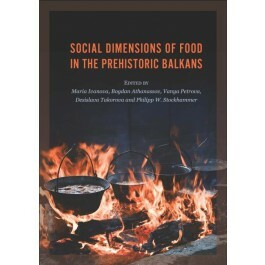 This volume brings together leading specialists in archaeobotany, economic zooarchaeology and palaeoanthropology to discuss practices of food production and consumption in their social dimensions from the Mesolithic to the Early Iron Age in the Balkans, a region with intermediary position between and the Aegean Sea on one side and Central Europe and the Eurasian steppe regions on the other side. The prehistoric inhabitants of the Balkans were repeatedly confronted with foreign knowledge and practices of food production and consumption which they integrated and thereby transformed into their life. In a series of transdisciplinary studies, the contributors shed new light on the various social dimensions of food in a synchronous as well as diachronic perspective. Contributors present a series of case studies focused on themes of social interaction, communal food preparation and consumption, the role of feasting, and the importance and management of salt production. "[an] exceptional volume… opening wider the gates into the unknown world of the first agriculturists, herders and metallurgists and hopefully will inspire many to bring food studies into their research."